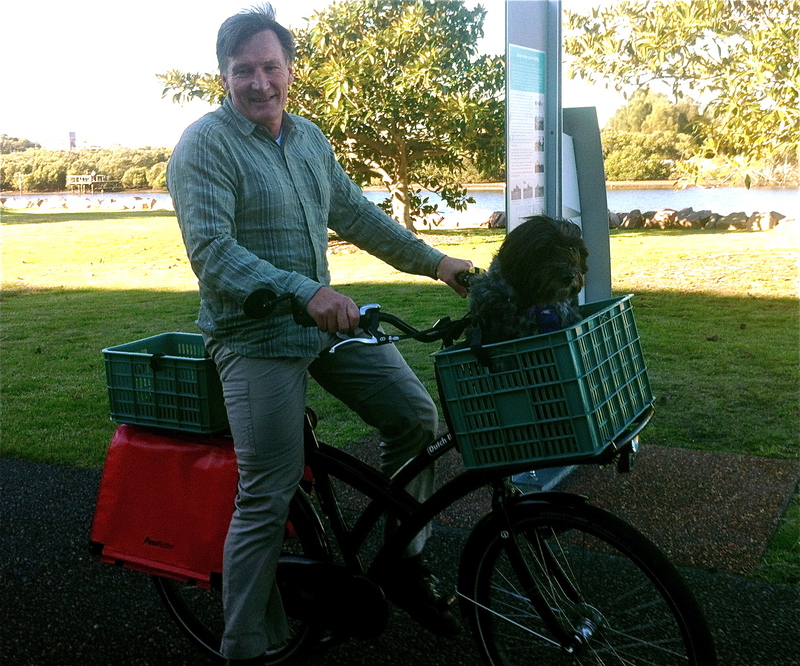 I ran into Bernie Hockings, out riding with his adorable dog … In addition to being one of Newcastle’s leading bicycling activists, Bernie, with his partner Lyn, is a Dutch bike aficionado. 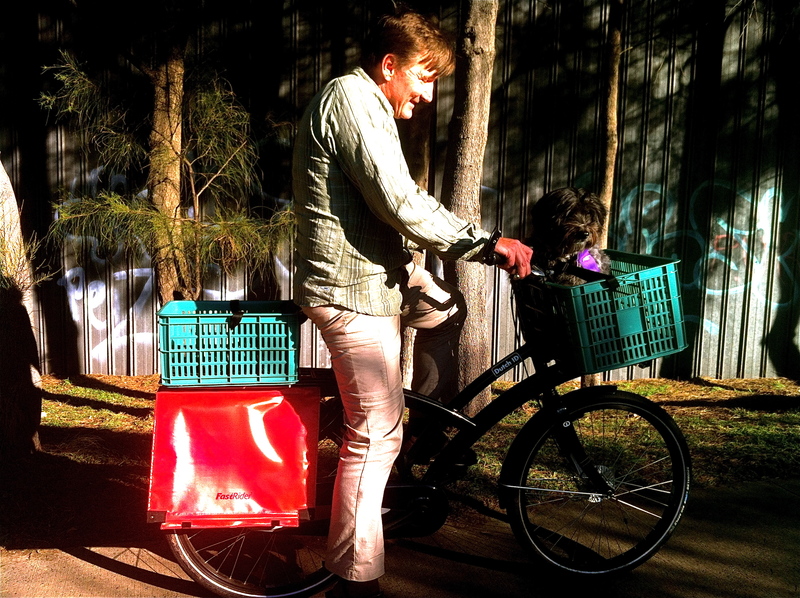 Bernie and Lyn own two Gazelles and also this Dutch ID, ideal for ensuring a smooth and fun ride for their super friendly canine, who is also a biking fanatic: The setup of this bike means that the basket on the front does not move as the handlebars turn, and Bernie says when they use it to do their grocery shopping it can easily carry 60kg. 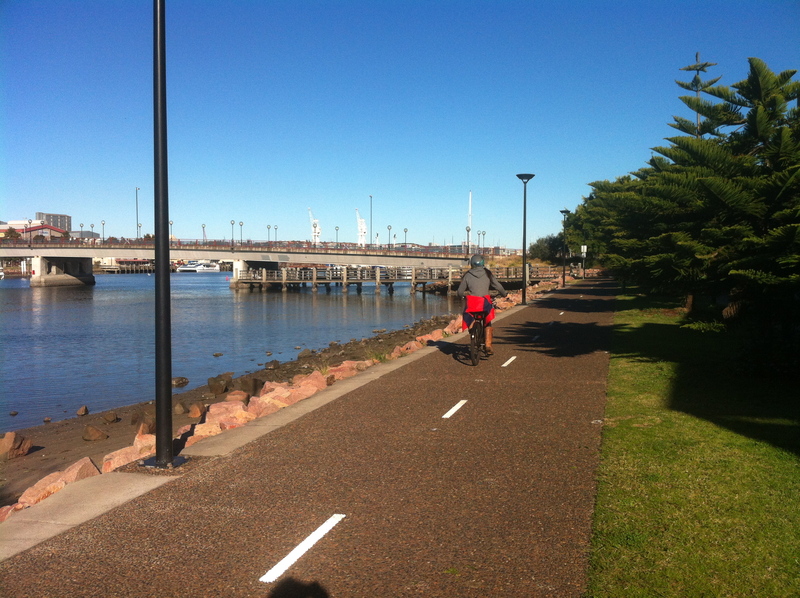 It is easily possible to be car free in Newcastle and to do the shopping, commuting, children-or-dog-hauling and other errands by bike, especially if you live near the Throsby Creek bike path. While this is most likely the only Dutch ID in town, it would be great to see more bikes like this one around, taking advantage of the easy way out with transport. 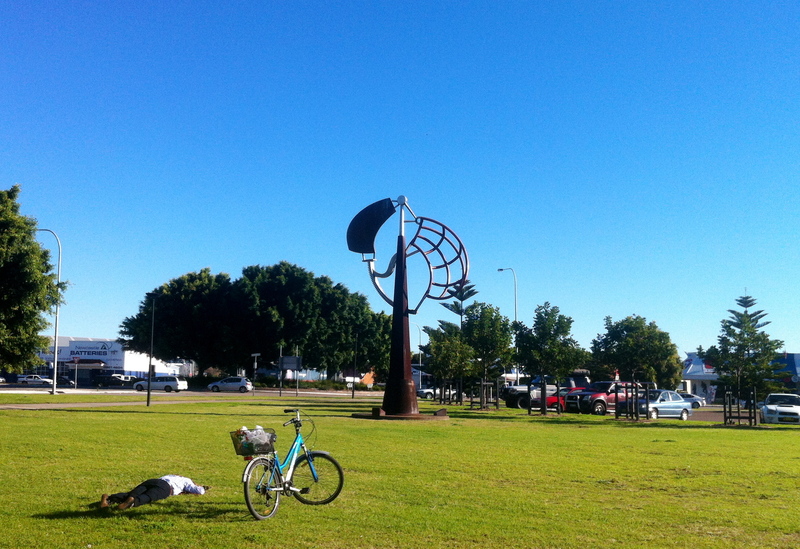 This entry was posted in Bike tracks and tagged newcastle bike tracks, street cyclist, Throsby Creek, transport cycling, unusual bikes, women on bikes. Bookmark the permalink. That’s one very well behaved and lucky pooch!!!! Vicki, is Newcastle mainly pretty flat? I must admit to never having been there and my geography is woeful. (I spend cycling/hiking breaks being constantly surprised). BB, Newcastle is mainly flat in the inner areas, but there is a huge hill right behind the main street and the harbour, aptly called The Hill, and directly around the coastline there is also a number of hills/headlands. But you can reach most inner areas, which includes the beaches, without having to ride up hills. In the outer suburbs, there are also some hilly areas, such as Cardiff, Charlestown, and New Lambton Heights, but if you choose where you live you could cycle everywhere you need to go easily. My biggest beef is with the hospital which is on a huge hill, that makes about the sum of my hill climbing when I go there once a fortnight. Out of town at Maitland and the Vineyards there are some great cycling spots too.